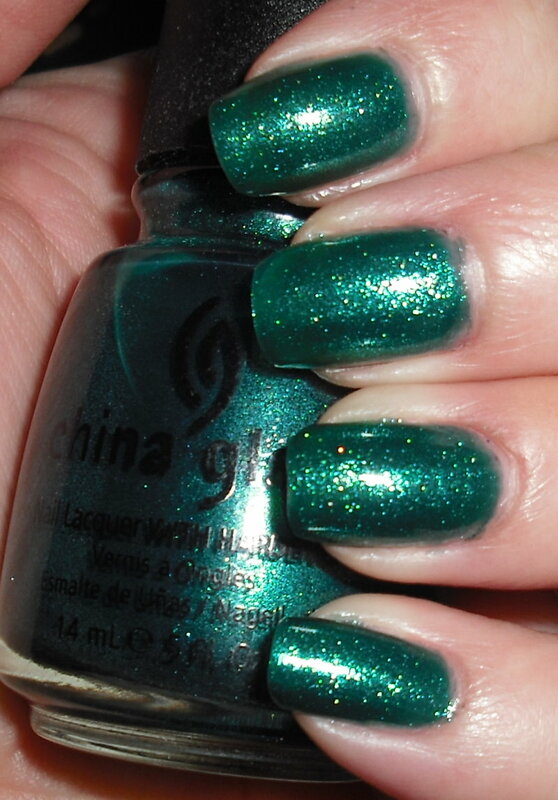 China Glaze Watermelon Rind was requested by quite a few people when I asked for requests a little while ago. Watermelon Rind was part of the Summer Days collection in 2009. This was a great collection. If you like glass-fleck glitters/shimmer these polishes are perfect for you. This collection also features my favorite China Glaze polish of all time Strawberry Fields, but this is about Watermelon Rind. :P Sorry, Strawberry, you'll be for another day! Watermelon Rind is a jewel toned emerald/jade green with silver glass fleck. This a beautiful color. It's very vibrant. This needs a solid 3-4 coats. The base of this polish is less opaque than other polishes and to avoid VNL (visible nail line) you'll need more coats. I think they nailed it with the name, this color definitely reminds me of watermelon rinds! My personal opinion will probably vary from the majority. This isn't exactly a favorite of mine. I love the color in general, but not necessarily on my nails. I tend to not be a fan of cooler toned polishes with silvery shimmers. I had the same issue with Grape Juice in this collection. I wish the glass fleck was a green color, but that's just me. I know you all probably think I'm crazy,but like I said majority of people will adore this color! I love it too, just not so much on me! thank goodness i am not the only one who doesn't like grape juice! Grape Juice and Watermelon Rind are not my FAVORITE China Glazes, but I do like them. 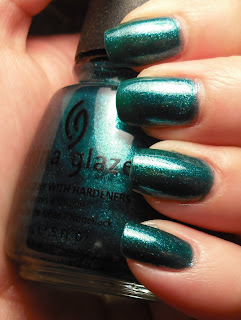 I think this looks pretty on you though and your swatches are great! I think this looks gorgeous on you- I actually didn't understand the hype over it, but seeing it on the actual nail I think it's way prettier! i saw this color in sally's today and almost bought it. it's very pretty! i may go back and get it. Sooo pretty! I want this one. I like this color! I'm a big fan of shimmer & glitter polishes and the color green.